Firstly, thank you to everyone who has participated in all the Queensland Flood Appeal auctions and raffles. Toni has been tallying the donations from the auctions and will add the raffle totals today, be sure to visit her blog tonight for a big announcement. Thank you to the ladies who joined me here in the Ribbons Galore raffle. $200 has been donated to the Premier's Flood Relief Appeal from this raffle. Thank you! The winner is commenter no. 8, Lisa (the Red Thread). Here's the pdf of the Random.com page with the winning number (I couldn't work out how to save a screen shot, so had to save as a PDF): Download Randomdotcomwinner . As a thank you to my raffle-ees (not sure that's a word) I have also decided to send out a Ribbons Galore 10% discount voucher to each of the the lovely ladies who entered the raffle here. I will send these out to you in the next couple of days. As I mentioned in my last blog post, Toni of Make It Perfect is organising/co-ordinating auctions, raffles and giveaways to raise money for the people affected by the Queensland Floods via the Premier's Flood Relief Appeal. Toni has had many, many crafty bloggers and stores offer goods for auctions and raffles, and there will be a master list of all the "events" up on her blog on the weekend. To take part in this effort, I am holding a raffle to win a $100.00 voucher for you to spend at Ribbons Galore. A $5 donation to the Premier's Flood Relief Appeal will give you one "ticket" in the raffle. This giveaway is open to anyone, anywhere in the world. To enter this raffle please donate $5 to the Premier's Flood Relief Appeal. Once you have donated, come back to my blog and enter the raffle by leaving a comment on this blog post with your receipt number and an email address. You may enter as many times as you like buteach entry / donation must have a separate receipt number. (eg: donate $5 ten times if you want to donate $50, then leave ten separate comments each with a different receipt number. The raffle will end Monday 24 January 2011 at 9am Wednesday 26 Janurary 2011 at midday. 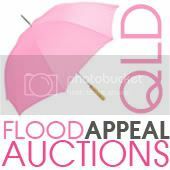 Please note that the closing date for the raffles in the Qld Flood Appeal Auctions have been extended. I will cover a "one off" postage cost WITHIN Australia (a total $6.00). If a winner is picked from overseas, there will be an additional postage charge for international shipping. If you are unable to leave a comment here on my blog, you can click the "email me" link (right hand column) and email me your name and receipt number and I will comment on your behalf. Please only comment here with your receipt number... other comments will be deleted to make the picking of the winner easier. If you are the lucky winner, I will contact you by email and send through a store voucher for $100.00. You will need to register as a customer on the Ribbons Galore website to be able to use the voucher and place your order. If there is a problem with this, I'm happy to discuss other shopping options with the lucky winner. The voucher can be used for any in-stock goods in the store. Additional note: please keep your donation receipt (this can be a PDF of your bank transfer or the emailed receipt from your direct donation) to show if you are the winner.